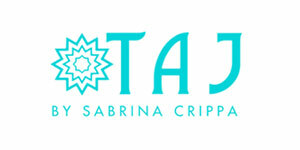 Taj by Sabrina – Dunas Lifestyle – Quinta do Lago – Algarve – Portugal. The only stockist in Portugal. From her home resort of Miami, USA, Sabrina designs exotic and exquisitely decorated beach tunics and kaftans. Begun in 2006 after inspiring trips to Asia, Sabrina’s beach wear collection is full of colour and vibrant print. This collection will always make you feel glamorous wherever you are in the world.